Open source CMS – “Content Management System” is a web or content creation tool for managing information or content on a webpage for a large number of audiences around the world. This whole process of content creation, management, and publication of web content can be effortlessly done without any programming language through an intuitive graphical user interface. There are lots of web content management system available on the market. These are in between of 300 to 400 CMS platforms. You will be lost in choices when you go for choosing the right one. So the question comes into focus is which content management system is optimally supported for completing your desired project. Now come to the question of which type of web content management system do I adopt? There are both open source CMS and proprietary software available in the market. Open source comes with free access into the source code which ultimately can be modified to change, improve and adapt as per the requirements. A group of community-driven developers is always there to solve the problem or to contribute on a large scale for enhancing the stability and usability. That’s why, in this Best Content Management System review, I will focus on only those which comes as a free and open source. Open source content management system has come a long way through a wide range of evolution of improvements and achievements. With this array of progress, now you don’t need to hire any web developer or designer to create a website. You are alone quite enough to make and publish any news or content website without even any coding skills. Following the above prospects and requirements, here I have brought a generic list of Best Open Source CMS software for your dream project. 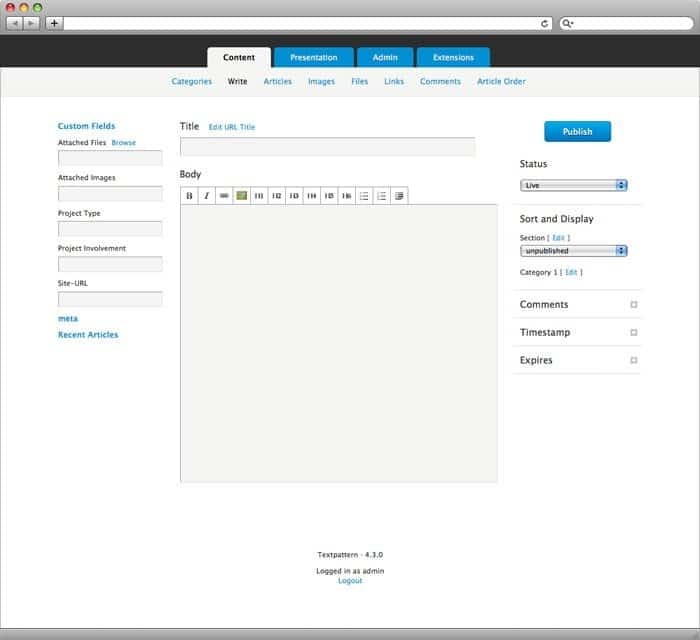 WordPress is one of the best open source CMS platforms available on the market. You can make any content website with the help of this fantastic content management system like news publishing site, blog site, e-commerce site, forum site and what not. WordPress holds a firm grip on almost 65% market share among all other open source CMS platforms. This top content management system is robust, user-friendly and gets updates regularly. There are thousands of themes and plugins available to increase the functionality of WordPress hosted sites. In today’s online world, most of the person or business content publications rely on WordPress and UbuntuPIT.com is no exception here. Joomla is another best open source CMS for hosting a blog or any other web publications. Joomla focuses on security aspect more than that of any fancy decoration. The interface is quite impressive but not easy to use and flexible when you compared to WordPress. Though Drupal is not as straightforward as WordPress; still, it’s considered as one of the best enterprise level open source CMS. Drupal also offers a wide range of modules as like as WordPress like plugins to increase the functionality of your websites. Drupal modules repository is not as vast as WordPress one, but the choices are not less though. 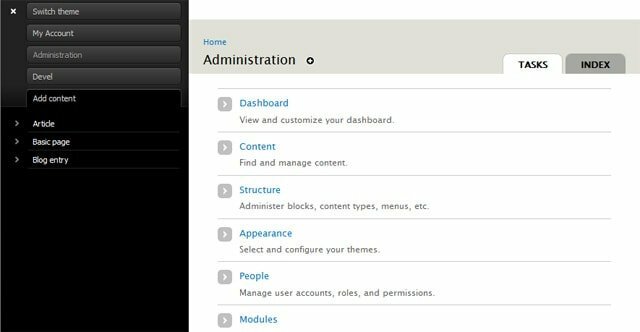 To understand the Drupal content management system, you have to go through some documentation. 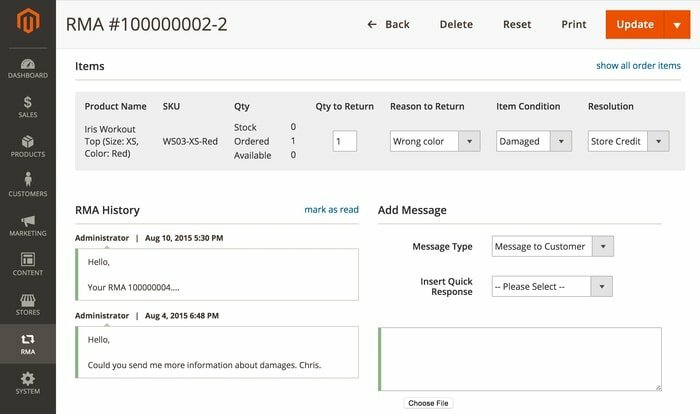 This open source CMS is best suitable for an e-commerce site. If you are a professional content publisher and want a secure, reliable but yet free and open source, then Thunder is the right choice to go with. It helps you to create and manage content quickly and easily. It has a vast community, so if you face any problem regarding this best open source CMS, those people are always ready to rescue and support you. Ghost is a powerful modern publishing technology and open source CMS for creating a stunning online blog or publication. It’s considered as best open source CMS alternative to WordPress and a robust content management platform designed for the future. It’s secure, simple and specially tailored for blog or publication with modern website UI elements. It has some advanced level features like built-in SEO, accelerated mobile page, simple markdown based editor, RSS feed management, email subscriptions, etc. 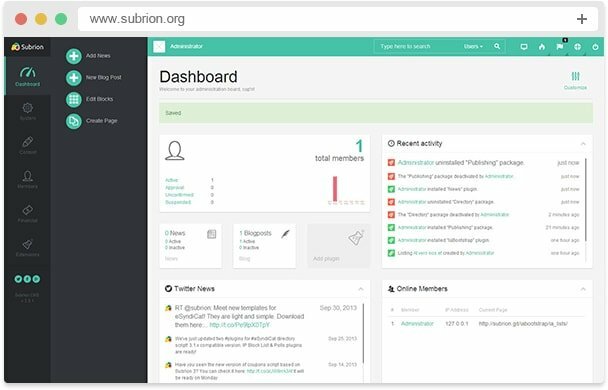 Subrion is a free and open source content management system based on PHP/MySQL framework. It’s effortless to use and extend, has lots of themes and plugins, and overall suitability for any websites from personal blogging to a corporate megaportal. Though Textpattern is a simple, lean and clean content management system still it can successfully handle your big project. Its code based on the solid foundation and you can increase the functionality with the help of great community-driven plugins. Textpattern offers a tag-based content template which has a simple and elegant user interface. Unlike any other open source CMS describe here, Jekyll is not a full packed content management system; instead, it’s a static web content creation tool which comes with prepacked with GitHub. That means you can convert the simple plain text information into a static page which ultimately will not charge a penny even. What do we expect from a good content management system? It must be easy to use, should have intuitive user interface, supports theme and plugin for increasing functionality, offers modern responsive design, provides dynamic content and image processing system etc. To fulfill all those above described needs, I present you “Grav” which is a modern and faster website builder and open source flat-file CMS. 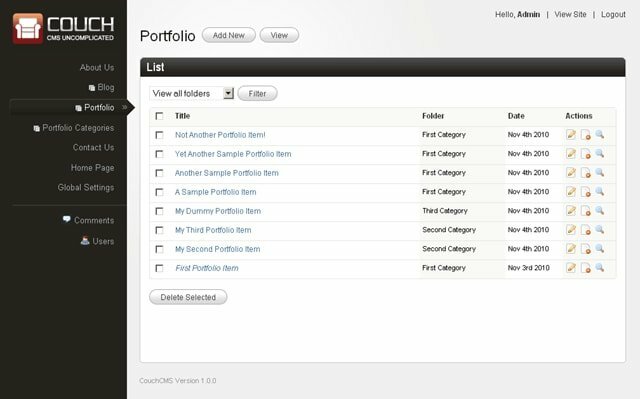 TYPO3 CMS platform is one of the top content management systems made for enterprise landing pages. Thought this open source CMS does not offer modern UI elements, but it’s an open source, free, fully featured and reliable for small sites to multinational corporations. TYPO3 is effortlessly easy to use and best suitable for those business pages that don’t require maintained regularly. CMS Made Simple™ is yet another powerful open source CMS for all type of users including editors, designers, and developers. It’s user-friendly, highly expandable, and provides lots of powerful add-ons for creating compelling websites. In the arena of CMS platforms, there are not much to make an e-commerce site. Magento is one of that open source CMS for creating an e-commerce site quickly and effectively. Thought the community edition comes open source and free, but you may need to pay for unlocking all the premium features. But I can assure you that the primary and free features which come with Magento are quite enough for developing a small blog or e-commerce site. dotCMS Hybrid CMS is a robust open source content management system for making the website more intuitive and modern sleek design. 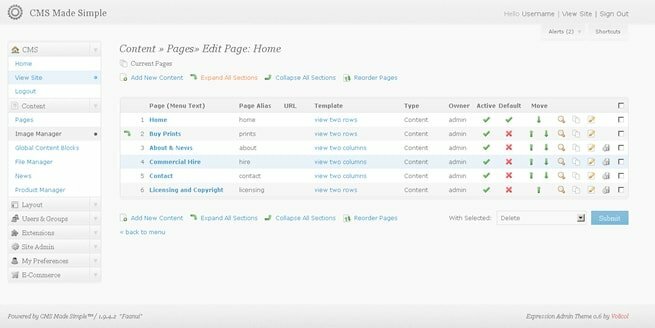 You can quickly create, manage and control content publishing with the help of dotCMS Hybrid CMS. Microweber is a multipurpose CMS for both a personal blog and e-commerce sites. Though it provides a limited set of features for managing and developing e-commerce sites if you are searching an open source CMS to manage your content in no time, then this CMS platform may be an excellent choice to go with. This open source CMS offers modern website templates and UI for managing the web content efficiently. 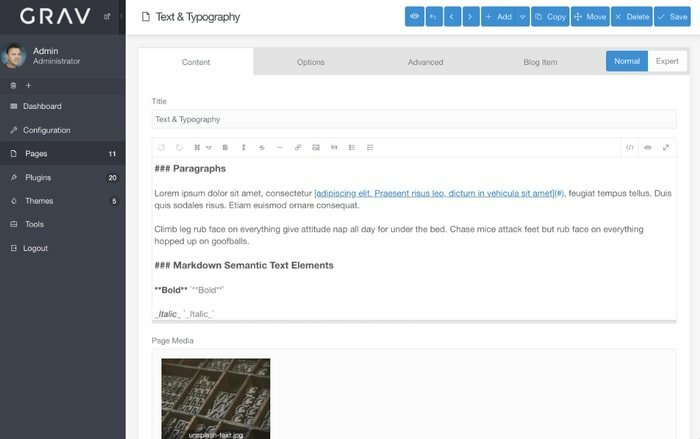 It also lets you design the content site using unique drag-drop technology in real-time text writing & editing feature. MODX is a faster, scalable, secure, and easy to use open source PHP CMS. It’s a free content management system which will let you enjoy complete creative freedom. PyroCMS is relatively new in the world of open source CMS which comes under MIT license. This web content management system platform lets you design the website created in a comfortable, simple and faster way. 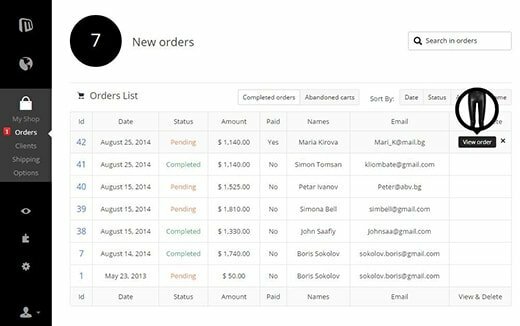 It’s a 100% free and open source which comes with a simple, clean, consistent and responsive control panel. Its interface is modern and simple. It has a wide range of modules which are used to add more functionality into the core system. Contao open source CMS is there around us for quite a long time since 2006. It’s an accessible, easy to use, intuitive, and mobile-friendly open source content management system. This top content management system is quite suitable for Enterprise, Business, E-Commerce, Portals, Microsites, and Nonprofit Organizations. SilverStripe is a robust and secure, flexible, easy to use open source content management system available in the market. It offers some old-school type web creation content template to develop your site, but if you have a bit coding skill or can hire a developer, then this web content management system can prove worth using. Plone is an ultimate enterprise compatible open source content management system. It has a flexible workflow that means you are in control of how your content is created, stored or shared. Like WordPress, the Fork is another best open source CMS which comes prepacked with lots of themes and extensions. It has a user-friendly and intuitive user interface that makes it the best content management system for both professionals and beginners. Concrete5 is another powerful open source content management system where you can create and manage the content without any designing or coding skills. It supports modern responsive design and comes mobile-ready. It offers a set of SEO tools prepacked that ensure your content SEO optimized from day one. CouchCMS is a simple and open source CMS for a web designer. If you don’t have any PHP or coding knowledge, no problem, go with this one to create and manage your online business or web content. CouchCMS is best for both simple blog and multi-sites. Zenario is an innovative and exciting open source CMS to manage the content but still isn’t a full packed all-in-one CMS like WordPress or Joomla. It’s reliable, secure and best choice for e-commerce, online database and multilingual sites with IoT applications. 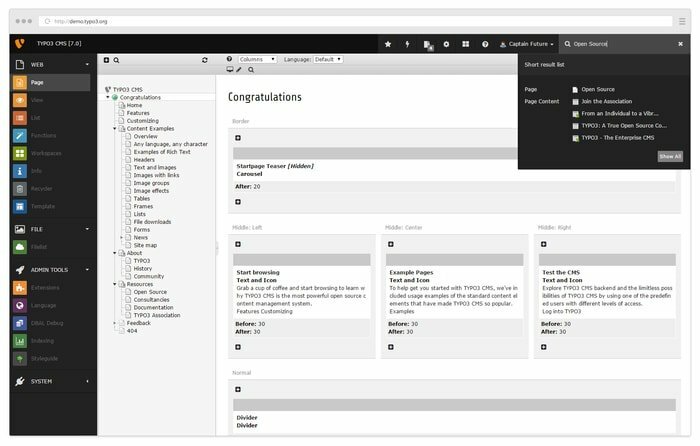 BackBee CMS is a bit different from any other open source CMS described here. It’s a fully featured CMS platform prepacked with unique On-page Editing Technology (OPE Technology) and SEO. It focuses on mobile first content ready and offers a powerful content editor. You will be able to write content without going to the backed and as you see. Radiant is also another simple web content management system with the intuitive user interface and easy to use. This CMS platform is built with Ruby on Rails Under the MIT License. It also has a plugin and template supports. Now I have come to the last of my open source CMS article. In this review content, I have described all the best content management systems including multipurpose CMS, static page generator CMS; enterprise equipped CMS, e-commerce CMS and so on. There are lots of open sources CMS available in the market, and that makes the user confused to choose the best one for the project or website. The best content management system will depend on your purpose and aim of making the website. But if you are confused which one to choose, I recommend you to install a multipurpose CMS like WordPress, Joomla or Drupal which ultimately provides a lot of plugins, modules, and components to meet the different needs. I hope this content helps you to get the best open source CMS for your dream website. If you like it, please take a moment to share it on your social media and professional network which will encourage me to write more quality content. Moreover, if you have any queries or suggestions, please let us know in the comment section. Thank you for reading and spending some time on UbuntuPIT. Thanks Ubuntupit, for letting us know about open source content management systems.